The National Association of City Transportation Officials (NACTO), an organization that represents 63 cities and 11 transit agencies across North America, and the Better Bike Share Partnership today released Strategies for Engaging Community (pdf), a practitioner’s guide to building meaningful and effective relationships with constituents and historically underserved communities. This guidance, developed by and for cities, community-based organizations, and shared active transportation operators, outlines strategies to engage with communities and offers examples and best practices for implementation. 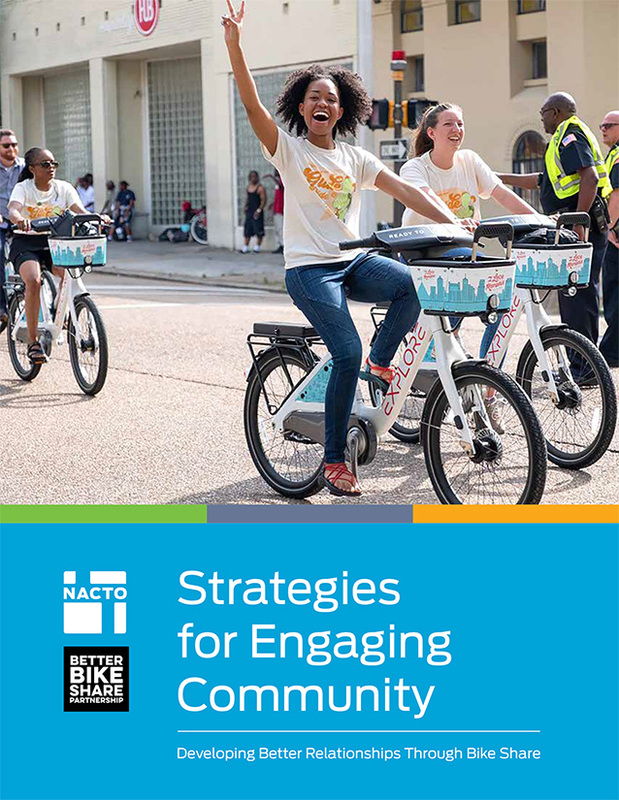 Grouping engagement efforts by three broad goals – increasing mobility access, getting more people on bikes, and increasing bike share awareness and support – the guidance outlines strategies, tools, and examples that can help ensure that bike share is relevant and useful to all users. Importantly, recognizing that mobility solutions are largely community-need driven, the guidance focuses on strategies and resources to help practitioners use bike share to support the human infrastructure in communities that have been historically underserved by transportation services. The guidance connects goals to intended outcomes and offers simple steps practitioners can take to develop programming and make meaningful connections throughout the communities they serve. Developed largely by bike share practitioners, this guidance can be applied broadly to many types of transportation planning. NACTO is an association of 63 major North American cities and 11 transit agencies formed to exchange transportation ideas, insights, and practices and cooperatively approach national transportation issues. The organization’s mission is to build cities as places for people, with safe, sustainable, accessible, and equitable transportation choices that support a strong economy and vibrant quality of life. The Better Bike Share Partnership is a collaboration funded by The JPB Foundation to advance equitable and replicable bike share systems. The partners include the City of Philadelphia, the Bicycle Coalition of Great Philadelphia, NACTO, and PeopleForBikes.